Flash flooding is increasingly possible today, especially across the Southern Tier in the Elmira area. Click image to enlarge. The same areas that saw heavy rain on Monday are at risk for more heavy rain on Tuesday, raising the risk for flash flooding. The weather pattern over the Eastern United States remains stagnant. A large low pressure system over the Southeastern US and a high pressure northeast of New England are both stalled out. Between these two systems, a belt of excessive moisture is feeding into the Mid-Atlantic region off the Atlantic Ocean and into the Finger Lakes. 24-Hour rainfall estimates (shading) and reports from Monday, July 23, 2018. Click to enlarge. Bands of rain have been and will continue to set up from south to north while also moving north. This results in the same areas seeing repeated bouts of rain, oftentimes heavy. Yesterday, the heaviest rain fell in the Elmira area, where 2-4 inches fell. So far this morning, the rain is just east of those areas and generally light to moderate. However, like yesterday, the rain should become heavier as the day goes on and thunderstorms develop within the areas of rain. These downpours will have the capability of dumping 1-3 inches of rain in an hour of time. 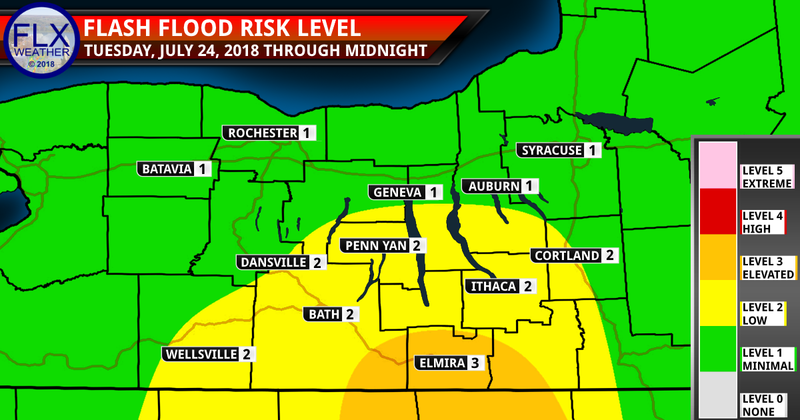 That would be enough to approach or exceed the estimated amounts of rain necessary for flash flooding, especially across the Southern Tier. The Flash Flood risk map at the beginning of this blog reflects that. There is some uncertainty in where exactly the heaviest rain sets up, which is why the yellow low risk area is wide. The reality is that the heaviest rain will fall over a relatively thin west-east area, like yesterday. Whether this sets up over the Elmira area, to the east, or to the west, is uncertain. It is also possible that there are two bands of heavier precipitation in the area. This uncertainty also precludes the addition of a red high risk area. 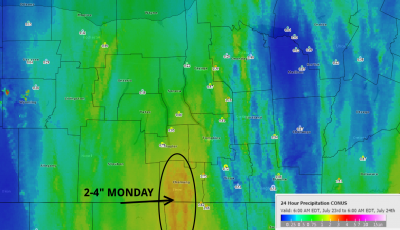 If I were more certain that the heavy rain was going to fall in the same areas it fell yesterday, I would have used the Level 4 risk in Chemung County. Flash flooding is much less likely in the areas shaded in green. However, that does not mean there is no risk. Even those areas should be weather-aware today in case some heavier downpours do develop. This map is only valid through midnight tonight. Additional heavy rain is possible after midnight and into Wednesday. This rain could end up being more widespread, thus expanding the flooding threat. If necessary, a new map will be posted tonight. Flash Flooding is a dangerous, life-threatening, hyper-localized phenomenon. It is important to be prepared and to know what to do should flooding threaten. Every time flash flooding strikes, social media fills up with videos of people driving or even wading through flood waters. This is very dangerous and puts lives, including those of first responders, at risk! Water is extremely powerful. Fast moving water can quickly knock a person off their feet. Flood waters can wash away the road, unbeknownst to travelers, leading to a situation where cars literally drive into a river. Standing water can have many hidden dangers, including missing manhole covers, sharp objects, etc. Please do not enter flood waters! I say this repeatedly because I see it happen time and again, including here in our area. In flash flooding situations, even small streams can quickly turn into dangerous torrents. If you live or work near a stream or river, monitor it closely and have an evacuation plan in place before the water rises. Urban flooding can also be dangerous and strike with little warning, flooding low areas and large parking lots. I will be monitoring the situation today and will continue to post updates as necessary. Know someone in the flash flood risk areas? Share this post with them using the buttons below!